The floors smell of rot, the walls are pocked with mold and mildew. The only light comes from a small, barred window and the flickering of the torches in the corridor. Below said window is a wooden cot for sleeping. In a corner of the room is a bucket for... ahem. Somewhere nearby, a guard sneezes and grumbles. These cells have clearly not been cleaned in a long time, and they probably won't any time soon. As bad as it sounds, you might as well get comfy. You may be here for quite some time. The guard sergeant huffs quietly as he shoves Isouda through the guard station. Eventually, he takes her through a reinforced door on the left and down a few steps before shoving her into a short hallway lined with prison cells. He takes her to the nearest empty cell and removes her manacles before shoving her in. The cage closes behind her with a loud CLANG! and she is locked in, an official resident of the local prison. "You'll be waiting here, girl," he grunts. He then turns and walks away, the keys jangling in his fist as he exits. Isouda's feet hurt as she had walked between the guards to the jail. Upon seeing the guard sergeant she had tried to move away as she had been pushed towards him. She glanced around her, shaking her head stumbling as she felt the guard sergeant shove her through the guard station. Looking down at her manacled wrists winced, the guard that had put them on had put them on tight to the point where she couldn't even try to pull out of them. Reaching a reinforced door looked up before she felt as she was lead through it and looked down in order to not fall down the few steps. When Isouda looked up she was looking down a short hallway, the smell was horrific and she wrinkled up her nose. "What is that smell? Have they ever been cleaned?" Looking at the guard sergeant with a look of disgust on her face, as she was shoved into the hallway. Glancing down it realized that it was full of prison cells. Looking down at her hands again let him take her to the nearest empty cell, shock showing in her eyes as she watched the guard sergeant remove the manacles from her wrists starting to rub them before she felt as she was shoved into the cell before she even had a thought of trying to slip past him to escape. Before she even had a chance to think about slipping past him again Isouda heard the door to the cell close with a loud clang causing her to jump. It was then that she noticed that she didn't hear the jingle of her purse as well as the bag with the fruit in it. "I will be waiting for what?" listening to the jingle of the keys before shouting, "where is my my purse and bag?" After hearing the door to the cells close looked around before going to lay down on the wooden cot her eyes watching the door to the cell. After a little while she turned around starting to cry softly as she looked at the wall until she had fallen asleep. The door creaks open slowly as Commander Farrenworth enters the hall, then closes with a dull thud. The old soldier makes his way to Isouda's cell, looking down on her with a sharp glare. His cold, blue eyes bore down on her more like a disappointed parent than that of an authority figure. Pitiful, he thinks. Just pitiful. She is still but a child, yet she has already turned to crime. He softly pinches the bridge of his nose, clearly distraught. Not very often does the guard have to lecture a prisoner. He takes a breath, then opens his mouth to speak. "Wake up!" he shouts, rattling the cell door with his hand. "I've been sent to speak to you, miss Isouda." His tone was formal, his body rigid. His gaze had not shifted since he'd arrived. Isouda shook her head in her sleep as she heard the door to cells close. She could feel eyes on her through the bars of the cell door. Hearing as Commander Farrenworth shouted for her to wake up rattling the cell door as he did, Isouda turned over slowly opening her eyes looking up at Commander Farrenworth shaking her head as she sat up. "What do you want?" her eyes still puffy from her crying. As she finally woke up the rest of the way shaking her head. "Why are you here? Where are my things? Afraid that I will escape?" her expression serious "let me out of here or at least bring me my two bags, unless you are afraid I will try to escape." Isouda sighed looking at Commander Farrenworth as it suddenly hit her that he had called her miss, she had never been called any title. Being disinherited by her extended families meant that she would never have any title. "I have never had a title even if it was miss, my grandmother the Lady Arabella made sure that my father was disinherited after he announced his engagement to my mother the daughter of a merchant. She also made sure that my mother's parents Reinald and Egelina were made to also disinherit their daughter my mother Imeyna by paying them quite a sum of money to stay quiet." She shook her head she knew from the short time that she had stayed with her father's family that she knew in their eyes she was an illegitimate, and even though her grandfather Lord Lancelet had two mistresses Lady Rohesia who had three sons the eldest had taken her father's place as heir while the other Lady Alyna had two daughters. They had only taught her due to the fact that her mother had threatened to tell her parents what they had done and the reason for it, as well as Imeyna had to pay Lady Arabella a monthly sum of money, after the fire she had no reason to keep teaching a granddaughter that in her eyes was illegitimate and would never marry beyond her illegitimate status or at all. In her grandmothers Lady Arabella's eyes she did not exist and she was just another orphan that lived in the streets, now and even when her parents Imeyna and Owen were alive and she was being taught by Lady Arabella on how to be a lady she was treated more like a servant then a granddaughter. Isouda was pulled out of her thoughts as she looked up to see Commander Farrenworth still standing in front of her cell door. "Yes? Sorry I was just remembering my extended family to whom I do not exist." Looking down at her hands the imprint of her mother's necklace around her neck was on them, she had apparently been clutching it while she slept, and the imprint of the ring that had belonged to her father had left a deep imprint in her hand as well, all her other personal items were in her personal bag with a special side pocket where she put a small bag with things she had stolen and didn't sell. "You are here because you were caught in the act of stealing, and because you assaulted the guards who apprehended you,' he replies matter-of-factly. "And your possessions are safe. Do not take me for a fool, young woman." He calls over a nearby guard, then opens the cell door, stepping in. The guard closes the gate behind him and steps back, watching through the bars. "As for escaping, I fear that would prove rather difficult." He pauses, listening to her speak. An interesting story. Not exactly something that would prevent someone from calling her 'miss', though it does explain her current scenario. She goes quiet for a few moments, possibly thinking, then mentions her extended family. "I believe I remember the scenario regarding your family," he says. "Though that only makes this more shameful on your part, miss Isouda. What would your parents think? Do you realize that, in many other cities, you would face the stockades for stealing? They would flog you. Or even cut off your fingers or hands." Isouda looked down at her hands tears forming in her eyes. "my parents are dead, they would want me to at least survive as I was the one piece of joy in their lives." Suddenly realizing that Commander Farrenworth had entered the cell, when he mentioned the punishments for stealing panic showed in her eyes. "What is going to happen to me?" As she thought about the punishments further, she knew she was too young to receive any of them, two of her older friends who were of age had gotten punished being flogged and it had scared her, but now she couldn't help but worry that she would end up the same way and she needed her hands and fingers for sewing and embroidery as well as other things. Standing shaking her head as if to clear it, before looking at Commander Farrenworth, "my parents would have told me to do anything that i could to take care of myself as they would know that my extended family would not." Crossing her arms she suddenly remembered she still really hadn't eaten anything, "Commander Farrenworth, you try not eating for several days to weeks and you would do the same as I did. I usually have a enough money from selling embroidery that i do, but no one has been interested in any." Keeping quiet about the other things she had stolen. Isouda then also realized that she hadn't had anything to drink. "Is there anyway I could get some food and water?" Abraham listens as the girl talks, thinking about her answers. Surely it wasn't too hard to find a job in this city, even for a girl her age. She could easily be a waitress or farmhand. He clears his throat. "Miss; I'll have you know that I know what it is like to not eat. Secondly, why not just get a job? The average worker makes two shields each day. That is far more than enough to pay for your meals, and to pay for a night's rest in the average inn. After a few weeks, you should have enough to pay for your own lodgings." He sighs, shifting his weight. "Miss Isouda, to put it simply, there are several other options available to you. I think your parents would rather you be a dedicated worker who is able to support herself than some street miscreant who would shamelessly steal from others to get by." With this, he turns to leave, ordering the guard to let him out. Before he leaves, he turns to look at Isouda. "It's nearly breakfast. Your food and water will be here in about ten minutes." With that, he walks away, the gate slamming shut the moment he is clear of it. A few moments later, the large door can be heard creaking open and slamming shut. Isouda had tried to find employment, but no luck no one wanted to hire someone who had been stealing for six years. She watched as Commander Farrenworth left the cell, tears stinging her eyes once more as she laid down on the bed, listening to the door to the cell slam shut as well as the large door she had been led through before. Once again turning away from the door, once again started to cry herself back to a restless sleep, shivering slightly she didn't know how long she'd be in the jail. Her long hair flowing down her back and over her shoulders covering her face. Waiting for the door to open again and her food to be brought. 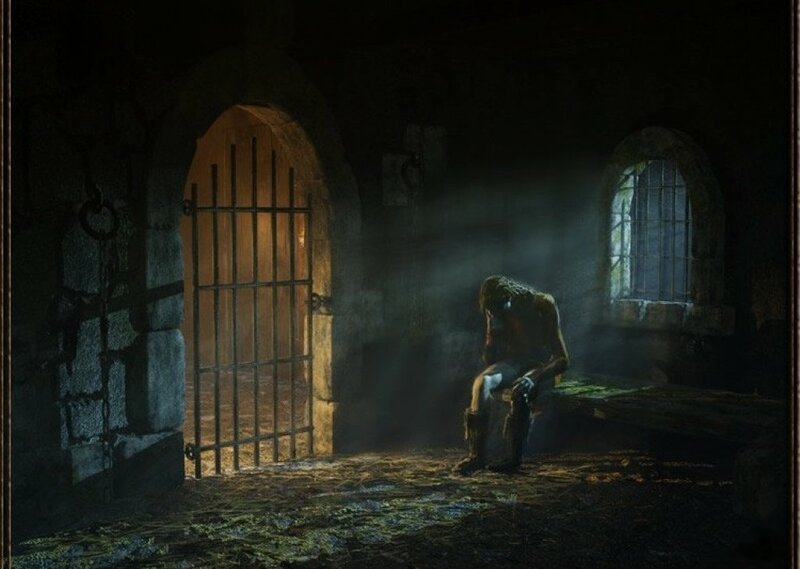 A guard enters the cell room, his thick boots thudding dully over the stone floor. With a clang, the door is unlocked, and his towering frame enters the cell. He stood at least a good seven feet tall, and his body was practically an oak's trunk in thickness. He decides to wake her with three hard kicks to the foot of the cot. "The cap'n decided to let ya out," he says in a rumbling, deep voice. From this perspective, one could almost assume he were an orc. The man steps to the side and holds his arm out toward the door, keeping his eyes on her as he does. "You go first. No funny business."